It’s rather remiss of me not to have written about this before now. The launch night was ‘one of those nights’ where anything could happen and it did as the crowd mingled with designers, stars and the ultimate Burlesque artiste, Miss Dita von Teese. 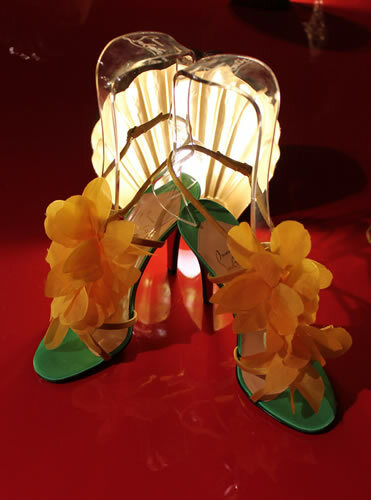 Open from 1st May 2012, the exhibition not only shows the life works of Monsieur Louboutin but also makes you feel the experience and excitement of new shoes, is nothing short of exhilarating. As it’s on until 9th July, I’d advise you to get there while you can…you won’t regret or forget it. The exhibition takes you on a thrill ride (the theme is fairground focused) as it celebrates Louboutin’s career to date, showcasing 20 years of designs and inspiration and revealing the sheer theatricality of a Louboutin design and the lure of the red sole from stilettos to lace-up boots, bright satin heels and Swarovski encrusted, bejewelled pumps – they are all there. From first entrance where walls of shoe lasts greet the visitor to sneaky shadow outlines of the shape of things to come, the exhibition is a gasp a second as the beauty, the elegance and power of Louboutin heels is revealed. Like a kid in a candy store, any woman worth her salt won’t know where to look first. Mini works of seductive art, this is the stuff of dreams. At the core of the exhibition is a unique exploration of Louboutin’s design process, taking the viewer through every stage of the design journey, revealing how a shoe is constructed, from the initial drawing and first prototype through to production in the factory. Then there’s the theatre. 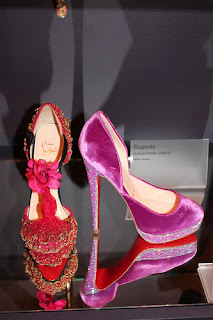 Monsieur Louboutin has always been obsessed by Folies Bergere showgirls and their glimmering theatricality so each of his flight of fancy designs presents a woman with the opportunity of transformation, of being the centre of attention, of feeling like a red carpet star and of creating an illusion. These are not merely shoes, these are wish makers. Says Louboutin, “every woman wants to be a showgirl” and uses his muse, the gloriously glamorous Dita Von Teese as the icon. And here she is at the exhibition, looped in a hologram form on a large screen above a bright red (naturally) stage, transforming into a glittery stiletto and back again over a breathy, sensual soundtrack. Each section of the exhibition should be savoured like a fine champagne and sipped instead of gulped. There is so much to take in, 9 inch ballet pumps, floral bedecked works of art, fetishistic thigh high boots, embroidery, glittering jewels and the clash of satins, each and every one is begging for a new home. 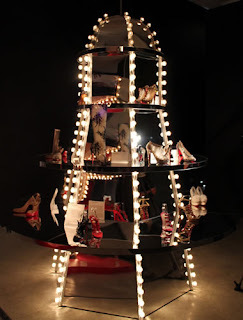 There is even a flash of fetishism as the visitor makes their way through a curtained off section revealing a dark, black display of Louboutin’s 2007 Fetish collection, all under bell jars and with accompanying David Lynch photography. Magical. For futher details on opening times please see Design Museum website.